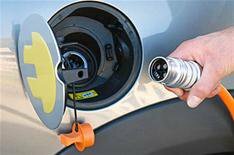 Electric vehicle trials begin | What Car? Following yesterday's news that the Government is to provide £25 million for trials of electric cars, manufacturers participating in the Low Carbon Vehicle Demonstrator programme have outlined their plans. Ford has announced a fleet of Ford Focus BEVs (Battery Electric Vehicles), to be tested by a team including Scottish and Southern Energy employees, and engineers from Strathclyde University. The fleet will be based around Hillingdon, Middlesex, and will start trials early next year. Ford already offers electric versions of the Transit and Tourneo Connect vans, converted by Smith Electric Vehicles. Toyota is to trial 20 plug-in Prius prototypes, with lithium-ion batteries and a recharging function to boost the hybrid's range in electric-only mode. The trial, in partnership with EDF Energy, will start in London next year, and cars will be leased to public bodies and private corporations including the Greater London Authority and Government agencies. The Mini E will be tested by private drivers as well as corporate and public sector employees. BMW is to shortly release details of customer pricing and a launch date. The field trial will be monitored by researchers from Oxford Brookes University, Scottish and Southern Energy, the South East England Development Agency, Oxford City Council and Oxfordshire County Council. Private and public recharging points will be located in the Oxford area and other locations in the south-east. Smart is running two 12-month UK programmes, one in London and the south-east, and the other in the West Midlands. A particular focus will be on domestic recharging systems. A fleet of 100 electric Smart Fortwos is already in operation, and a further 100 will arrive in the UK early next year. Partners in the project include EDF Energy, Ove Arup & Partners, the Greater London Authority, Elektromotive and Westminster City Council. From November 2009, Mitsubishi is supplying 25 all-electric i MiEV city cars to West Midlands' CABLED (Coventry and Birmingham Low Emission Demonstrators) consortium, which includes industry, council, academic and power organisations, and is led by design and engineering consultant, Arup.